And consequently chooses Russia over the U.S. again. 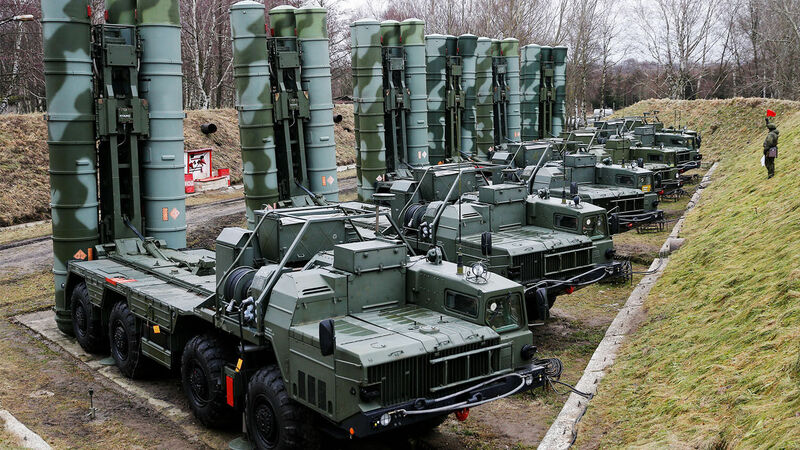 India has confirmed that it will take delivery of Russian-made S-400 Triumf air defense systems beginning in October 2020 and expects the transaction to be complete by April 2023. This represents a major boost in Russian-Indian relations at the expense of India’s fledgling relationship with the United States. The $5.5 billion deal for five air defense units had been on the negotiating table for years and was finally signed on Oct. 5, 2018. The S-400 is one of the most advanced surface-to-air defense systems in the world. Pointing two missiles at each target, the system is capable of simultaneously shooting down 80 targets up to 248 miles away at an altitude of up to 19 miles. Initial negotiations between Russia and India were complicated by the threat of United States sanctions. The associate director for India and South Asia at Control Risks consultancy, Pratyush Rao, called the deal a “catch-22,” saying India was walking a “diplomatic tightrope between a trusted but waning partner [Russia] and a growing yet temperamental partner [America].” India has a history of strong relations with Russia. India is the world’s fifth-biggest defense spender, and 68 percent of its military equipment is supplied by Russia. India’s relations with the U.S., on the other hand, are still relatively young. The threat of U.S. sanctions arises from President Donald Trump’s August 2017 signing of caatsa—Countering America’s Adversaries Through Sanctions Act—sanctioning Iran, North Korea and Russia. India verified this statement by signing the deal into force on Oct. 5, 2018, hoping that President Trump would use his authority to waive sanctions. The U.S. has not yet indicated whether it will enforce the sanctions. Some believe that President Trump will put principal priority on maintaining the strategic relationship with India. Others believe that waiving sanctions will undermine U.S. authority and could cause other countries to seek similar concessions. Either way, the final decision will likely be withheld until transfer of weapons begins in October 2020. That is what the U.S. did with China, which was sanctioned last September with the transfer of the first S-400 defense unit. By taking the risk and signing the deal, India has shown the world that its relationship with Russia trumps its relationship with the U.S. India has refused to abandon one of its oldest allies and has reassured Russia that it is still a valued defense and strategic partner. This militaristic alliance between Russia and India was prophesied. The Bible describes a massive bloc called “the kings of the east” (Revelation 16:12; Daniel 11:44) that will wield a 200 million-man army (Revelation 9:16). Scholars generally agree that “Gog” is Russia, and that “the land of Magog” includes China. The descendants of Meshech and Tubal have been found together throughout history. In Assyrian and Greek histories, Meshech appears as Musku, Muski or Mushki—all names related to the Russian spelling of Moscow, as you can read in the International Standard Bible Encyclopedia. What about Tubal? On the eastern side of the Ural Mountains lies the city of Tobolsk, named after the Tobol River, derived from Tubal. Tobolsk was once the seat of Russian government over Siberia and was basically considered Russia’s Asian capital. Gomer refers to Japan, which wields some of the world’s most advanced weaponry and technology. Ethiopia and Libya should be translated “Cush” and “Phut.” Though some of Cush and Phut migrated to African nations, the rest settled in parts of India. The context of this passage shows that it refers to modern-day Indians (and perhaps Pakistanis) rather than Africans. This is significant because India has a population of 1.2 billion people—plus an advanced nuclear arsenal! When you put India and Japan together with Russia and China, it is easy to see how an army of 200 million soldiers could be formed. In light of these prophecies, it is easy to see why Russia’s increased interactions with India are so significant. India’s receipt of the S-400 system marks a noteworthy turn away from the U.S. and toward Russia, which will head this “kings of the east” alliance. Watch for the alliance of these nations to continue to strengthen as Asian nations draw together. For more information on this “kings of the east” alliance, please read our free booklet Russia and China in Prophecy.